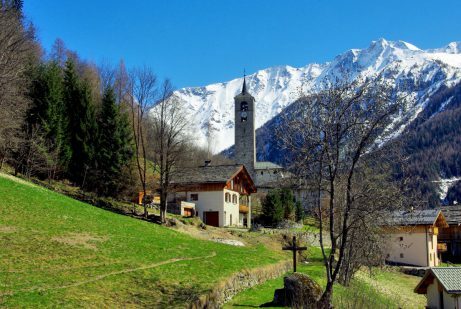 You’ve probably heard of major sites in the French Alps without knowing they were located in the Tarentaise Valley. If I tell you about La Plagne, Les Arcs, Tignes, Val d’Isère or Courchevel, do they ring a bell? Well these world-famous ski-resort are all located in the Tarentaise Valley in the département of Savoie where the Isère River flows. 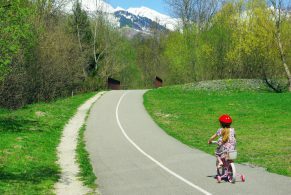 Follow me on a discovery journey along the Tarentaise from Albertville to the Iseran Pass. 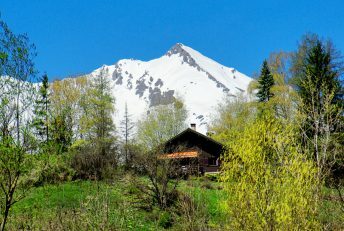 The Tarentaise Valley is situated in the département of Savoie which holds the number 73 in the alphabetical list of French départements. It is part of the historical duchy of Savoy. The Tarentaise was one of the six provinces of Savoy. Its name derives from Darantasia. This was the Gallo-Roman name of its former capital, Moûtiers. 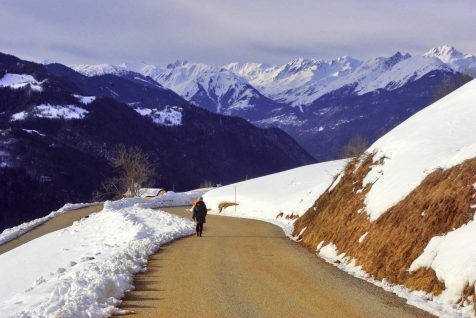 In all times the Tarentaise was a passageway towards Italy via the Little St Bernard Pass: travellers, traders, pilgrims, new ideas and armies. In the Roman era, three cities developed along the historic road: Moûtiers, Aime and Bourg-Saint-Maurice. The River Isère flows down the valley from the vicinity of the Iseran Pass (Col de l’Iseran) to Albertville. 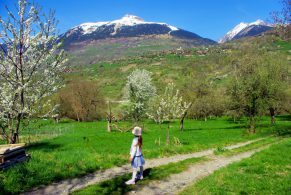 From there, the river enters a large valley (Combe de Savoie) to the direction of Montmélian where it heads South towards Grenoble. The Tarentaise province is limited in the north by the Beaufortain massif, in the east by the Aosta Valley (Italy) and in the south by the Vanoise massif. The road between Albertville and the source of the Isère river near the Iseran Pass involves a 180 km-long journey. 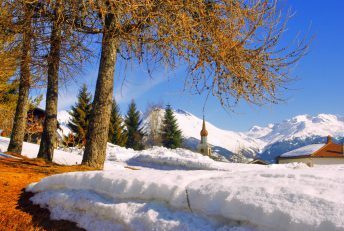 The Tarentaise includes many highlights from natural wonders and Baroque churches to gigantic ski resorts and spa-towns. 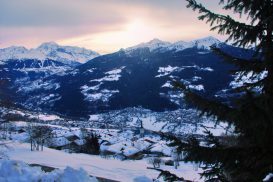 The Tarentaise Valley starts at Albertville, the host city of the 1992 Winter Olympic Games. 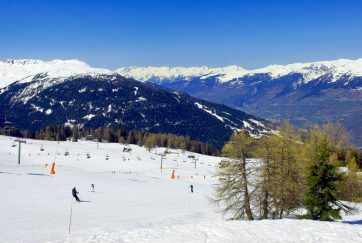 Most of the sporting activities and competitions took place in ski-resorts across the Tarentaise Valley. For this, France invested massively into building new expressways and communication networks that we are still enjoying today. For example, a dual carriageway links Albertville to Moûtiers, making it a lot faster (and easier) to reach the world’s largest ski-resorts than before. If you will find no much interesting things to discover in the centre of Albertville, don’t miss the perched medieval village of Conflans that watches over the city. 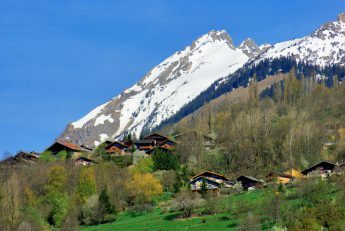 The ideal position of the historic village of Conflans – where the Tarentaise Valley and the Combe de Savoie meet – made it an important and strategic place. You need to drive out from the busy N90 to better appreciate the little treasures of this part of the valley: a few churches hiding baroque interiors, the small vineyard of Cevins, and the great ruins of medieval castle. The Chantemerle castle is perched on a rocky crest above the village of La Bâthie. It was built from the end of the 12th century and its ruins feature a circular keep and a defensive square tower. Another ruins are found further away nearer to Moûtiers. The Feissons castle was built above the village of Feissons-sur-Isère. The keep dates back to the 13th century and the corps de logis from 1536. Between La Léchère and Moûtiers the valley dramatically narrows at the Ponserand Gorges, also known as the Barrage des Échelles d’Hannibal. The N90 road winds its way through a series of spectacular bridges and tunnels before arriving as a sudden in Moûtiers. When I am visiting Moûtiers, I have to admit I feel like being somewhere in northern Italy. This is maybe due to the elegant iron balconies, the colourful façades and the picturesque cathedral. It won’t take you more than a couple of hours to explore the town. 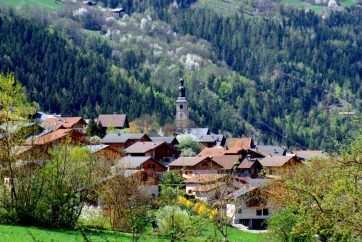 Moûtiers was once the capital of the archbishops of Tarentaise. Their authority over the valley was lost to the House of Savoy in 1335. 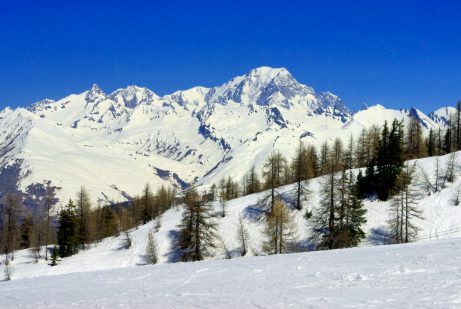 Moûtiers commands access to the Tarentaise Valley towards Bourg-Saint-Maurice and the Three Valleys (Les Trois Vallées) that include some of France’s largest ski domains. 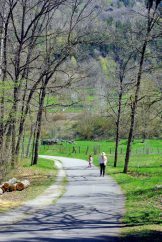 On your way to Bourg-Saint-Maurice, you will pass through the Etroit du Siaix, another site where the valley is suddenly compressed along the sides of the mountains. This is the narrowest passage of the whole valley of the River Isère. A tunnel was inaugurated in 1990 to ease the crossing of this dangerous place. From the village of Centron, the valley becomes more open and wider. 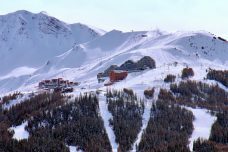 From Aime you can choose to take the road that climbs up to the Versant du Soleil, the adret slope of the mountain directly exposed to sunlight. 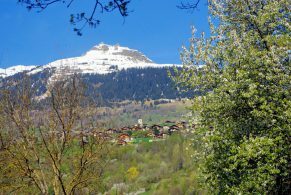 Spectacular views to the Vanoise massif awaits you as you cross the villages of Tessens, Granier, La Côte d’Aime, Valezan, Les Chapelles and Vulmix. 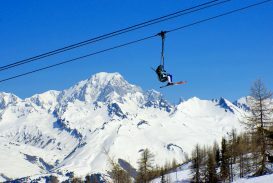 On the ubac (oriented south) the Middle Tarentaise gives access to the giant ski domain of Paradiski which gathers the resorts of Montalbert, La Plagne, Montchavin, Les Coches, Vallandry and Les Arcs. the D1090 climbs to the Little St Bernard Pass (2,188 m) through a series of endless hairpins bends. Dating at least from the Roman times, it connects the Tarentaise to Italy. the D902 follows up the River Isère to the Iseran Pass (2,764 m), the Alps’ highest paved pass. The D902 road winds up in a fantastic mountain landscape made up with pine forests, high pastures, stone chalets, waterfalls, tunnels, lakes, and glaciers. First the road crosses Séez known for its baroque church. Its name derives from “six” in Latin as it stood at the sixth milestone between Lugdunum (Lyon) and Milano (Milan). 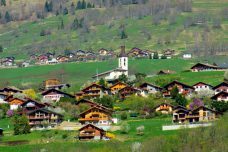 Next is the picturesque village of Sainte-Foy-Tarentaise and its old chalets with wooden balconies. 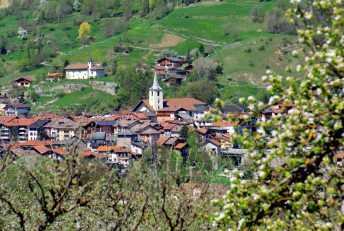 A few hamlets of Sainte-Foy and Montvalezan are worth a visit for their traditional habitats: Le Châtelard, Le Miroir and Le Monal. 24 kms from Bourg-Saint-Maurice stands the monumental dam of Tignes which stops the waters of the artificial Lake Chevril. 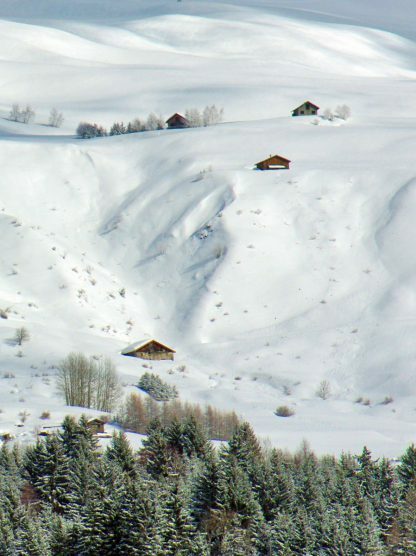 Two of Europe’s most renown ski resorts are found beyond the lake: Tignes and Val d’Isère. The climb to the Iseran Pass is a long and steep one. From Bourg-Saint-Maurice, it takes 48 kms and an ascent of 1,955 m through a series of tunnels. The mountain pass links the Tarentaise Valley (Isère River) to the Maurienne Valley (Arc River). 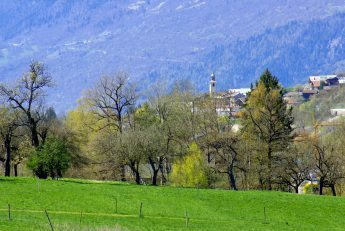 They are a number of tributary valleys that join the main valley where the Isère River flows. 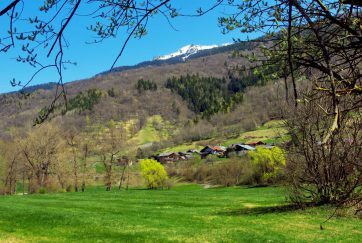 These valleys are historically part of the Tarentaise region. 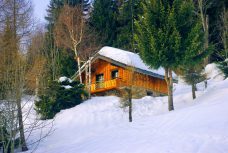 Mostly found on the south side of the Tarentaise Valley, they are occupied by some of France’s busiest ski resorts. They are called Dorons (streams). 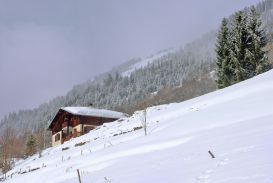 Valley of Doron de Bozel (ski resort: Courchevel). 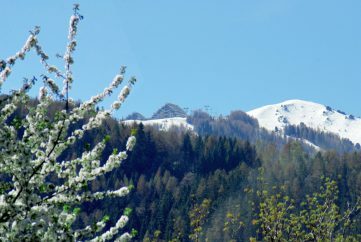 The latter three valleys are known as Les Trois Vallées. This is the world’s largest ski domain with over 600 kms of ski slopes. The south side of the Tarentaise Valley borders the limits of the Vanoise National Park, created in 1963. 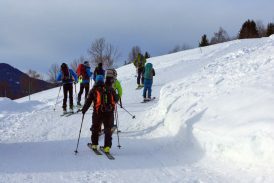 They are several ‘gates’ to access the National Park easily: Pralognan-la-Vanoise, Champagny-en-Vanoise, Peisey-Nancroix and Tignes. 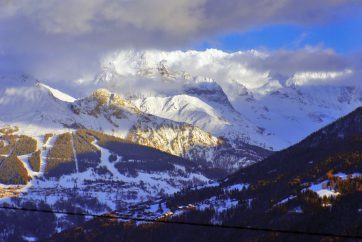 Some of the highest peaks of the massif can ben seen from many parts of the Tarentaise: Bellecôte (3,416 m), Mont Pourri (3,779 m), Grande Motte (3,656 m), and Grande Casse (culminating peak at 3,855 m). The Tarentaise boasts a rich religious heritage which manifests itself in Baroque style. 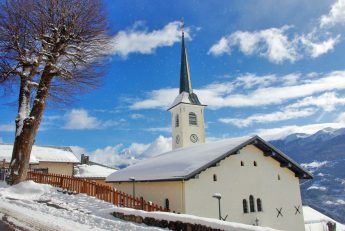 The Middle Tarentaise comprises a great number of churches with onion-shaped steeples reminiscent of Italy and Austria. If the exterior of the sanctuaries is usually sober, the surprise comes from the extravagant and sumptuous inside. Many of them take pride in housing a beautiful altarpiece placed in the choir of the church or in side chapels. They are characterised by a profusion of ornaments and sculptures finely designed with colours and gold. 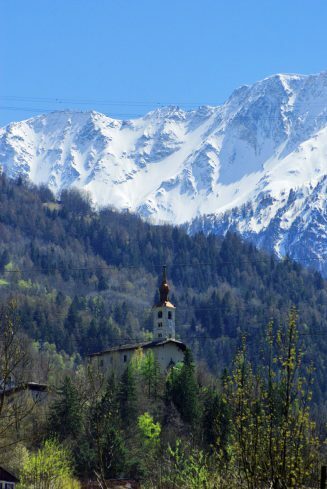 On your visit to the Tarentaise, check out the churches of Aime, Bozel, Champagny-en-Vanoise, Conflans, Granier, Hauteville-Gondon, Landry, Les Chapelles, Mâcot-la-Plagne, Moûtiers, Peisey, Séez, and Vulmix. 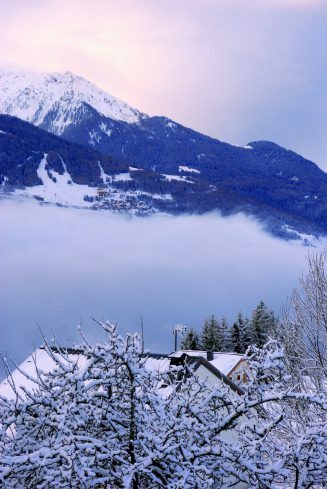 Three alpine spa-towns are found in the Tarentaise: La Léchère-les-Bains, Salins-les-Thermes and Brides-les-Bains. La Léchère-les-Bains specialises in the treatment of vascular diseases, gynaecological complaints and rheumatism. 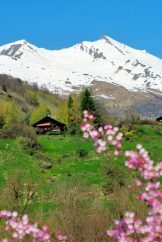 Brides-les-Bains is a pleasant and peaceful spa resort on the way to discovering the Vanoise massif. Spa treatments offer weight-loss sessions and specific slimming and renewal programmes. On your summer holiday to the Tarentaise you will encounter the local alpine cow grazing of high pastures with its huge bell worn around the neck: the Tarine. For centuries, the Tarentaise has had its own breed of cow (the mountain cow was given this name officially in 1888). From the end of the 19th century, the Tarine spread across Savoy and the mountainous regions of France (Vosges, Pyrenees, Massif Central). During the 20th century the cow was exported to North Africa and North America. The Tarine cow is recognisable by its uniformly reddish-brown coat and its black hooves and eye hair. The Tarine is at ease in all mountain landscapes. The dairy cow is a generous milk-producer (4,850 kg milk per year). 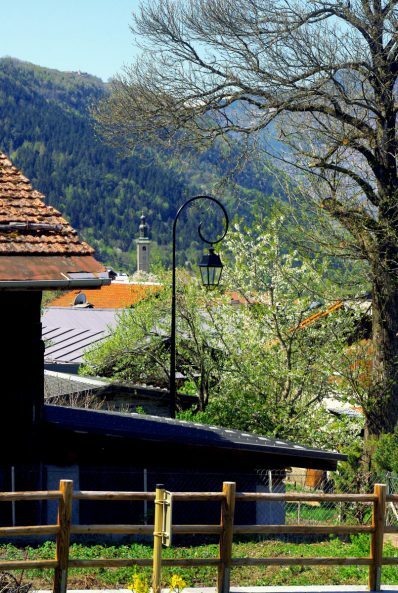 The cow’s milk is essential for the production of the local cheese: beaufort, the prince of gruyère cheese. The official website of the Vanoise National Park (French only). 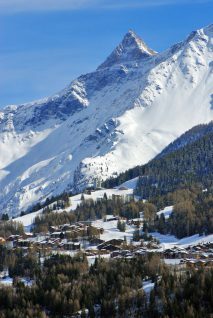 Have you been to the Tarentaise Valley? Let us know where are your favourite sites by commenting below! Next Article Where to find Paris’ most beautiful doors?